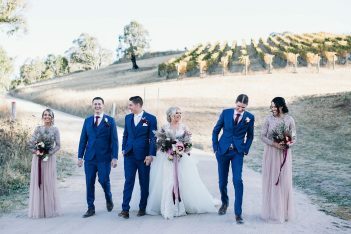 The Retreat is a unique wedding venue surrounded by natural bushland. Backing onto the most amazing sand dunes, We truly offer a venue like no other. The property has a great range of accommodation for up to 98 guests, indoor and outdoor function areas, a beautiful bush back drop and an abundance of fantastic photo opportunities onsite and out on the dunes. Your guests can relax and make this a getaway for the weekend and extend into the week. No need to drive or hire cars everything can be done at the one place. The Retreat has a brilliant catering team to cater for the whole event. Individual menus will be designed to suit your theme and/or budget with a huge range of catering options. You will work directly with our caterer to create the menu of your dreams to ensure that everything is exactly as you wish. If you have a preferred caterer or you wish to self cater, this is also possible. As part of booking the whole property, you have full and exclusive access to the indoor function room and outdoor areas. Working with our local suppliers, the creation of dream weddings is made so easy and there are package options available to suit all budgets. We also cater for those who want to Elope. Enquire about our Elopement Packages today. Ask about our fantastic special rates for Midweek and Winter wedding. Great way to save $$ and create the wedding of a lifetime. We also have Elopement Packages available. The Retreat is a family business and we have had the property for 15+ years. We are passionate about each and every booking to ensure that everything is perfect and exactly as we promised. The Retreat is a truly unique venue being surrounded by bush land, offering a very private location while backing onto the most amazing sand dunes. The beach is just a two minute drive from the property, so you have the best of both worlds with the bush and beach meeting the dunes. 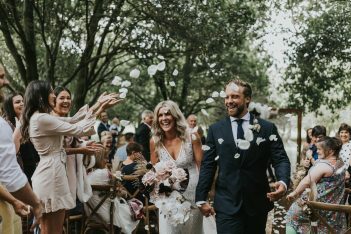 Our property is a place where everything can happen onsite with accommodation for all the guests, plus options for the wedding ceremony and reception. No need for cars or taxis – everyone can walk home. Private, peaceful and completely private for your special occasion. Your Wedding Ceremony offers stylish brides the chance to choose one of three gorgeous ceremony settings for an affordable price in one neat little package.